We were also lucky to find Twig (previously Free Spirit) had recently gone through a refit and had lots of new bells and whistles, along with important things like newer standing rigging (the wires that hold up the mast), a reinforced hull, mast step (where the mast sits on the keel), and an extra 900 lbs added onto the keel for extra stability. (Read: What Emily wants). The rig is a Solent Rig, which means the overlapping Genoa and self-tacking Jib are on separate roller furlings next to each other on the bow. The forward fore stay roller houses the Genoa which is deployed in light winds or going downwind. The aft solent stay roller houses the Jib which is self-tending and is used when going upwind. Having both sails at the ready is of great benefit during offshore passages where we stay on the same tack for many miles. Additionally, the rig is tall and the boat is relatively lightweight for a 43 foot ocean boat, which makes it faster in light winds. 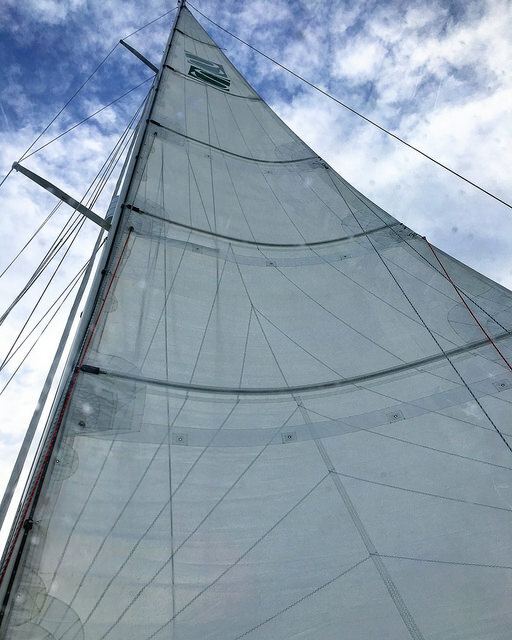 Fully battened, tri-radial main sail with 3 reef points. All in all, we had a short list of boat designs that would embody the things we wanted in a boat, with a Saga 43 at the top. She's a wonderfully strong and skinny boat which makes sailing enjoyable. For more information about our particular Saga visit wayoffthegrid.com, or if you have a Saga 43 and want to compare notes (and give us insight on all the tricks), please write to us or find us (MMSI 367572690) out there! Looking aft from the salon: head to port and Rev's berth aft of the head. Kitchen on the starboard side. Forward pullman berth with additional head in V.
Navigation station with mystery person (Forbes Horton) in background. One of my favorite things about the Saga 43 is a huge cockpit with ample drainage for entertaining and LIVING in while on a passage!